Short and sweet this week. I have been gone for nearly two weeks, and have LOTS to share. But in pieces. And not today. The first weekend I was at a quilting retreat in Minnesota with wonderful blogging friends. And these are the two projects that took most of my time. Do you remember this block? It was for a block exchange and I kinda fell in love with it. I have the center swirly fabric in lots of colors. So I made myself a challenge; to make blocks using every color. And for the outer half square triangles, I am using only Kaffe Fassett fabric, and it has to come from my stash, only with circle motifs or dots, no flowers. I have enough left over to duplicate the orange block. And these are the other four I have completed so far. See the little "oops" in the upper left-hand corner of the yellow block? I posted it on Instagram and asked for opinions. Nearly everyone said to leave it--that it added a little charm. So. What do you think? Leave it--or would it drive you nuts? The other thing I worked on was a project with Laurie Wisbrun's adorable llama fabric. I had a fat quarter pack and was able to fussy cut four cute little llamas. And then I used the hourglass blankets that two of them had across their back, using both the hourglass block and the colors for further inspiration. And reminded myself that not every quilt has to be large. Sometimes four blocks is enough. I love the pale grey crosshatch design in the llama fabric and will continue that design element by quilting the same design, at least in the llama blocks. I just love this little quilt. Two squares are completed from the Fusion Blanket Crochet-Along, and I seem to finally be getting the hang of crochet again (excuse the wrinkles--this came straight out of my carry-on bag). I have exciting news regarding Really Random Thursday. Some of my quilting retreat friends said they enjoy that segment and would like to do their own random posts. So hey! Let's start having a Really Random Thursday linky party. What do you think? If you are like me, you come across interesting things that have no connection to quilting or sewing or cooking or decorating, or whatever your blog is primarily about. That's the "stuff" of daily life sometimes. Save it up and share it with the rest of us! More details tomorrow. But you can already grab the button, designed by my fabulous friend, Terri. I had a great time in the beautiful state of Minnesota. But I'm also glad to be back home, and linking up to WIP Wednesday. love your llamas Cindy - and I'd have to undo the 'oops' - sorry!! love the crochet quilt, what a cool idea! I'd leave that little "outlier" too - it's quaint! I also llove your llamas (sorry; couldn't resist). Nice llama fabric! What a unique find! Those Llamas are just the coolest! Love what you're doing with them! The llamas rock. I'm completely in love with them. That fabric is too cool; your blocks are pretty outstanding. Love the Llamas!!! This is just such a beautiful quilt. Love the Llamas! Love the Kaffe blocks- I'd leave the yellow block as it is! I agree with Citric Sugar's comment about perfection. I like the idea of a 'random' day too! Love what you're doing with the Kaffe blocks and I'd leave that errant piece alone - not everyone has to conform! Timely that you're working with the Llamas - I'm staring at my FQ's of them wondering the direction - great idea! Welcome home!! I adore your llama project - so much fun!! But I'm also really liking your crown of thorns block collection. Looks like you've certainly been keeping busy!! i would leave the "oops" it reminds me of amish quilts. love love love the llamas. so stinkin' cute! the llamas are just unbelievably cute. great job! i would never have noticed the oops if you hadnt pointed it out - maybe its not too big a deal? I love your llama quilt! I made a pillow from her larger llama pillow and it makes me do happy to see it each day! I'm afraid if it were me, I'd have to fix the "oops". It'd be the first thing I'd look at every time I saw the quilt. That mini llama quilt is just fabulous. So vibrant and crisp. I love what you did with the llamas! I bought some of that fabric a while back, but really had no clue what to do with it. 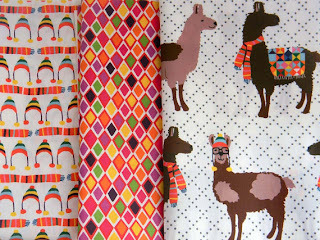 I just couldn't resist llamas on fabric! I like the oops, it almost looks intentional...like a statement on nonconformity (lol that is the art major in me talking). 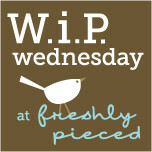 Thank you for linking up to WIP Wednesday! I love your fusion block! I've been working on mine, too. What have you been doing on the corners? I've been winging it because I always end up on a different stitch when I get to the corner. I admit if it were me, I'd have to fix the oops triangle. It would just drive me nuts. I adore your little llama quilt!! Sounds like you had a great time at the retreat. Love the blocks. As far as the oops, it doesn't matter what everyone else thinks. If it bothers you and you want to redo it, then redo it, otherwise it will bother you when the quilt is finished. If it doesn't really bother you, then leave it for the added effect. It's funny how a mistake couldn't be planned and how much interest it can add to a scrappy quilt. And the llamas are very cute! Love all your WIPs! Those llama blocks are so adorable. Love the way you framed them. I would probably leave the "oops" too. My philosophy is that handmade isn't perfect. Those little things give it charm and life. Good for you for getting so far with your crochet blocks! They look fab! One of the great truths in this post (among many) is that not all quilts have to be large. How freeing this idea is! I love minis all displayed on a wall--gives me more to look at as I move from idea to idea, in different colors, shapes, styles. Of course I love the Crown of Thorn blocks (is that what they are?) and I was working with the swirly fabric just this week. Last thot: working from the stash. Ah yes. Trying to do that right now. All your projects are so lovely....your little quilt is a favorite! Glad you had a good time and I love all your projects! Those llamas are hilarious! I love your llamas! If it were my block I feel the need to 'fix' it but I'd do my best to wait and see what it looked like when all the blocks were made and laid out...if it still bothered me at that point then I'd change it. Lots of lovelies, but I would have to swap round that corner - it would drive me potty! But other than that your projects are fun and happy. The Lamas are just too cute for words. As to your oops, I'd be asking the same questions....and then I would go ahead and fix it. I would have to fix the mistake. It would drive me absolutely crazy to just leave it and have the rest of the blocks be perfect. But I also think it's a really interesting element. I could totally keep it if I intentionally did the same thing in a couple other places in the quilt. I would totally fix that "oops"... it would drive me nuts! I love the idea of really random Thursday! Love the lamas too! My control freak side would fix the yellow block and my creative side would leave it. Don't know which side would win... I'd join in on the randomness! Your blocks are gorgeous, but that oops would drive me crazy. It's just plain wrong! And it's an easy fix begin on the outside as it is. Have fun with your random-ness. That's how my life is right now! I think you should leave the oops alone...it's charming and it's real. I love the llamas. They remind me of one on my daughter's favorite book series by Anna Dewdney, starting with Llama Llama Red Pajama. I LOVE what you worked on at retreat. I will link to your post so people can see. So, you figured out the crochet! LOL. My mom taught me while I was on vacation. So, I might try to join you. But I have more practice to do first. haha!